Back2Life Des Moines is celebrating its 1 year anniversary!!! Hosting and performances by legendary lyricist KEITH MURRAY of the def squad who brought you "get lifted" "the most beautifulist thing in the world" "fatty girl" just to name a few! It sounds going down at the Gaslamp 1501 Grand ave. Downtown Des Moines! 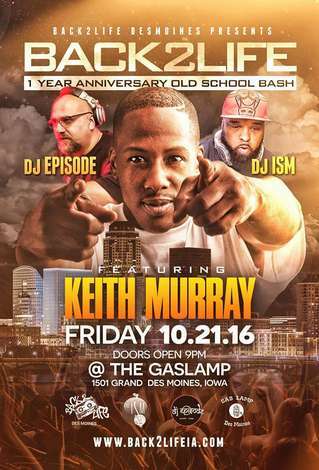 Dj Episode and Dj Ism will be bringing you the ultimate oldschool experience with special guest Keith Murray! DJs Ism (Donavon Green) & Episode (John Dayton) co-founders of Back2life Des Moines present a monthly musical experience taking you back to the throwback sounds of the 70s, 80s and 90s... live and direct on four turntables. It is more than a party. It’s an interactive G...ALATICAL™ (cachinnate), musical experience; a reason you'll never sit and be bored. You get to come alive; feel the music and move to the golden era of hip-hop, R&B, classic rock, 80s pop, and the true funk and disco all mixed by professional, passionate DJs. Back2Life was created because we want to bring the feeling back to an era of great times and great music (remembering the "good ol’ days"), to a simpler, more care-free time in our lives. We humbly honor the old-school music of the 70s 80s and 90s era. We cater to a crowd that appreciates when music spoke to our soul and made us “feel” something.